More than one ship succumbed to the massive storm that began on December 7, 1989 in the Gulf of St. Lawrence and continued for more than 24 hours, hampering search and rescue efforts. Both the Capitaine Torres and the Johanna B disappeared in the early morning hours of December 8, both north of Cape Breton and about 120 miles apart from one another. All of Capitaine Torres’ 23 crewmen and Johanna B‘s 16 were lost. 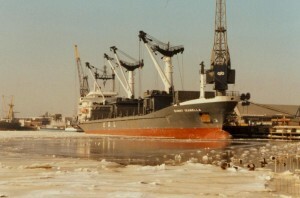 The Capitaine Torres was en route to Taiwan with container cargo from Portage, Indiana. Its crew consisted of French, Fijian, Dutch, Filipino and Vanuatu seamen. None were Canadian. The Capitaine Torres sent a distress call, saying that the cargo had shifted, causing it to list badly and causing several containers to be lost overboard. The crew was abandoning ship in enclosed rubber rafts about 36 miles north of Cape Breton. The captain of the Coast Guard’s ship, Sir William Grenfell, is convinced that he saw two or more people from the Capitaine Torres on life rafts, but by the time the ship could pull alongside, the rafts were empty. And no wonder. They took several severe hits from the two storey-high waves. Built in 1978 in South Korea and originally named the Sunny Isabella, the ship was renamed the Capitaine Torres in 1989. It flew the flag of Vanuatu but was owned by a company in New Caledonia, a South Pacific island. Few Canadians know of this tragedy, largely because it occurred just after the December 6 Montreal massacre of fourteen women at the École Polytechnique, an event that eclipsed most other news events at the time. In a letter to the National Post on December 6, 2011, Brian Latham of Yellowknife wondered why we still remember the women victims of the Montreal massacre but not the men lost from the Capitain Torres and Johanna B. Thanks to Allison Campbell, who brought my attention to this Wreck Site, where information about the Capitaine Torres can be found. I will be investigating this event further in the near future. Why is a single letter to the Post worthy of mention in such a short article? Who says we don’t remember these men? And why is this a competition? If the real question is, why did the media give a pre-meditated mass murder attention over a natural disaster, the answer is self-evident. Or should be. Thanks for your comment, Julie. I wasn’t trying to set up a competition between tragedies — I’m sorry if that’s the impression that I gave. There’s no reason that we can’t honour the memories of all those lost. I do think, however, that when people hear about this story, they’re so moved that they’re surprised that they don’t remember hearing about it. It is not at all surprising that this event was overshadowed by the Montreal massacre, for all sorts of reasons. But I personally also think that it’s significant that the men who died on the Captain Torres were not Canadian — and that fact, together with the significance of the Montreal massacre, ensured that this event did not get much press coverage. Could it be that you really don’t know James Keelaghan’s incredibly moving song about the loss of the Captain Torres? That’s how it’s spelt in the song, and yes, Keelo is Canadian. I am indeed familiar with it and agree that it’s incredibly moving. Your post made me realize that I had forgotten to tag the disaster info and Keelaghan’s song so that they would be associated with each other on the website. I’ve done that now, so you can see my write-up about Keelaghan’s song.